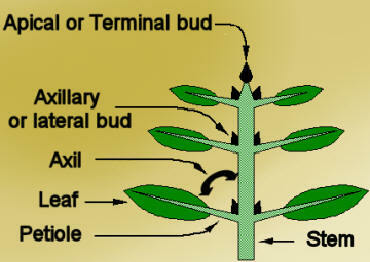 The apical (Terminal) bud of a plant is the primary growing point located at the apex (tip) of the stem. It is the dominant bud, since it can cause all the Axillary (lateral) buds below them to remain dormant. Terminal buds have special tissue, called apical meristem, cells that can divide indefinitely and produces all the differentiated tissue, including vegetative and reproductive organs. The terminal bud is the main area of growth in most plants. Its own growth exhibits apical dominance, inhibiting the growth of axillary buds. Around the terminal bud is a complex arrangement of nodes and internodes with maturing leaves.